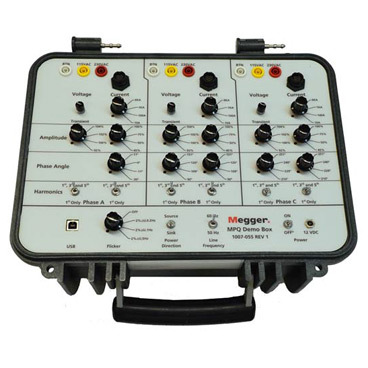 The MPQSIM Megger Power Quality Simulator is used for demonstrations and as a training tool. It is the perfect tool to use with the MPQ1000. The MPQSIM provides a simple and easy method for simulating a three-phase voltage configuration off of a standard single-phase source. The simulator provides both continuous voltages/currents and harmonics for trending as well as instantaneous events for power quality demonstrations and training.